If you made your way through the Patron Saints Retrospective section, you know that we are now up to the summer of 1975. The Saints, as we know them, no longer exist. Playing in Temperance with former Patron Saint drummer Paul D'Alton whetted my appetite to start a new group again. 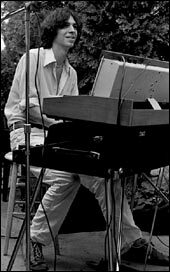 As luck and timing would have it, former Patron Saint drummer Joe Ivins, his wife April and new-born daughter Heather moved back to New York from Virginia in the late fall. Joe and I were ready to re-group, but by this time, no one we had played with in the past was still in the area! Fortune stepped in again in late 1975, when I just happened to run into Jim Behnke, a musician acquaintance who had played in a rival band a few years back. Jim, a formidable guitarist and more-than-capable keyboardist, was looking to start gigging again as well. 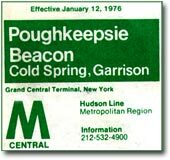 On New Years Day, 1976, Joe lured us up to Garrison, NY just across the Hudson River from West Point. Joe, his family, and good friend Don Kratzke had rented a great house (which was used by Barbra Streisand when she was filming Hello Dolly) in the center of town. It had a suitably large basement for practicing, willing tenants and cost us next to nothing; what else could you ask for? Jim Behnke, Dan Brown and Joe Ivins in Garrison, NY, 1976. 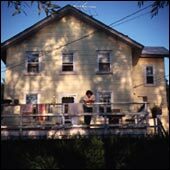 Dan standing on the porch of the Garrison, NY, house we used for practice and recording in 1976. Music from 'Big Yellow'? We still needed a fourth member to round out the group, preferably someone who played bass. I had written a number of new songs by this time, and was anxious to stay on guitar in this new incarnation. On February 18th, I put an add in the local PennySaver: WANTED - Bass player for "soft-rock" band. Original material. Must be sincere, dedicated and willing to work. We got a number of responses, but one really stood out. This guy not only played bass and guitar, but sang and had written a lot of his own music! We just had to meet him! So, sometime in the early months of 1976, Dan Brown came over to my house carrying his infamous Ovation acoustic/electric Balladeer 12-string guitar. After a few moments of first-meeting awkwardness, he played me one of his songs, Ten Cent Angel, and I played him one of mine, April's Fool. It was fairly obvious that the chemistry was there...we got off on each other's music and we all got along well. The final piece was now in place. It was now time to choose a name for the group, and despite the fact that Joe and I had started the group, we felt that the name 'Patron Saints' had finally worn out it's welcome; since we were based out of Garrison, we thought it only fitting to use 'Garrison's Landing', the town's actual, original name as our handle. 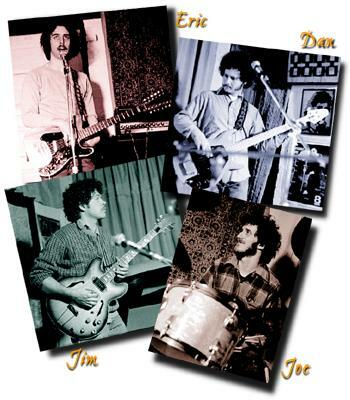 We started practicing four to five nights a week...we had plenty of original music to learn, including a few of Jim's originals, and we wanted to be sure we were tight before we started performing. As usual, I recorded nearly every practice, and occasionally attempted to have us lay down acceptable demo versions of various songs we were working on. As the weeks went on, there were a few tense ego-related skirmishes, but nothing we didn't think we could deal with. We were really looking forward to playing out somewhere; that somewhere eventually turned out to be the Garrison Middle School graduation, just up the road. Hey, it was a gig! June 25, 1976, then, was our first official paying engagement. As it turned out, this was also our last with Jim; a month or two later, the tensions within the group finally bubbled over, and Jim left. Once again, we were down to three looking for a fourth. Garrison Keyboard wizard Chris Suchmann in 1977. Joe, Dan and I felt that we were well taken care of in the guitar/bass department, so we decided to advertise for a keyboard player: KEYBOARD PLAYER - VOCALIST WANTED - For "soft-rock" original music band - planning to record and perform in the near future. Must be serious and motivated read the September 8th ad. I can't remember if it was the ad or Joe's sister Sue who introduced us to Chris Suchmann, but either way, the then 17-year-old keyboard wizard became the newest member of Garrison, which we had by that time shortened our name to. We practiced as often as we could, based, of course, on Chris's homework schedule! It was about this time that the old recording bug bit me again. I had always recorded all of our live gigs and a number of practices, but I thought that since we had so much original material, it might be time to produce an entire album. As usual, I couldn't be bothered with the prospect of seeking out an established record company...we felt fully capable of doing the whole thing ourselves.This time, Dan and I went into debt and bought two semi-professional TEAC A3340S 4-track reel-to-reel tape decks. After all, if Sgt. Pepper was recorded using two 4-track decks, why couldn't we do it? Our Garrison, NY studio control room in the basement, 1976. We began converting our practice area in a recording studio; it actually had a small side room which worked perfectly as a control booth. We picked out five of my songs and five of Dan's and began laying down tracks. Unfortunately, the "studio" wasn't heated, and since we were starting our masterpiece in the fall of 1976, it posed a bit of a problem. We solved it by oven-heating a rock which we would bring downstairs periodically to warm up our hands between takes, hence the moniker Hot Rock Studios. Bill Ivins' cover designs for our never-to-be-released LP, showing the town of Garrison in the present, and how it might look in the future. The other problem was a little more difficult to deal with. 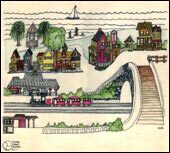 The downtown of Garrison is bisected by Metro-North train tracks; at regularly scheduled intervals, commuter and Amtrak trains would come barreling through, destroying any recording take we were in the middle of! Subsequently, we were required to record with a Metro-North train schedule close at hand. By the middle of December, we had finished recording nine tracks: April's Fool, One For The Road, Music In My Mind, You Opened My Eyes, All Men Are Brothers, Ten Cent Angel, Borrowed Time, Thinking About You and It's In De Blood (all of which appear on the 2001 CD release Garrison Anthology). At this point, we looked at our group finances and decided that we didn't have the money to actually produce an album, so we reworked our strategy and decided to release a 45 RPM single instead. We'd put out an album later (or so we thought); we'd name it Garrison's Landing. We even had the front and back cover artwork ready; Joe's talented brother Bill had generously created it for us (at left). Anyway, it was a lot cheaper to put out a single and we had eight completed tracks to choose from...we could put it out now. We picked Dan's You Opened My Eyes for the A-Side; we all agreed that it seemed to be the most "commercial" of the batch. My reggae-ish It's In De Blood was the choice for the B-side. After mixing-down these two tracks to half-track stereo, we were finally ready to slap these babies on vinyl! Our Garrison 1976 single, You Opened My Eyes b/w It's In De Blood. I called Chuck Cameron, who had mastered Fohhoh Bohob, and told him that we could afford to produce about 300 singles. 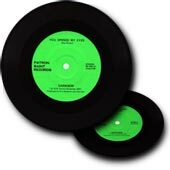 The company he used for pressing them was not particularly hip; inexplicably, they reversed the stereo channels and used small, 33-1/3 RPM sized center holes instead of the normal, large 45 RPM sized holes. We didn't think it was a big deal at the time (since we couldn't afford to fix it, anyway), but it proved to be pretty irritating later on; the first time the single got radio airplay, the DJ played it at 33-1/3 until the vocals kicked in. Apparently, that happened a number of times in various places. Not particularly auspicious. 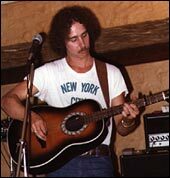 Me, performing with my Ovation Balladeer 12-string, in 1977. As the Saints had done with Fohhoh Bohob, we gave the Garrison single out to everyone. This time, however, we made sure that a number of radio stations all over the country (and world, for that matter) got copies. One of the first to play it was WRNW-FM, a local station in Briarcliff Manor, NY. The Program Director (who was, by the way, "Shock Jock" Howard Stern, and treated us very nicely) gave it his blessing for airing; a wise man! DJ Meg Griffin played It's In De Blood one night as I was driving home alone from a rehearsal...I almost drove into a tree! Definitely one of the cooler things to happen to me. Garrison continued to perform to support our single all over the tri-state area, but not much seemed to be happening. We were pretty much manager-less at this point in our career; Don Kratzke, Dan's brother James, P. Lynn Radok, Joe's brothers Ken and Bill and other friends acted as our constant support team. We trudged on through October or so, but the bottom seemed to have fallen out. This section of Garrison history is a little sketchy to me, but as tensions grew, I believe we finally disbanded over how we should split the costs of rented equipment. It was something stupid like that...typical band stuff. I was through with group politics. So during this "hiatus," I hatched a new plan: I was going to record a solo album. The Modern Phonography section of the site goes into great detail about the making of the album, but suffice it to say, the period from November, 1977 to April, 1978 was spent creating, producing and polishing the final product. I used three of the tracks that Garrison had recorded for our aborted album, and recorded six new tracks from scratch. 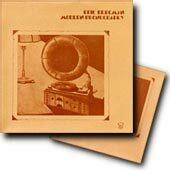 My first solo album, Modern Phonography, released in May, 1978. 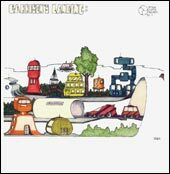 When Phonography was released in May of 1978, somehow or other, Garrison buried its' various hatchets, reformed and performed to support the LP. We decided to use the name Eric Bergman and Garrison so that it made sense with the solo album promotion; thankfully (I absolutely hated the name extension), we reverted to using Garrison fairly quickly. One of the biggest boosts to my/our career was the result of tenacious friend and fan, Ingrid Lombardi (Guerci). She wrote to a number of papers extolling our virtues, and finally caught the interest of music columnist and author (The Face of Rock & Roll: Images of a Generation) Bruce Pollock, who interviewed me and kept track of our success.We played a number of venues throughout the summer and early fall, but once again, the group just ran out of gas. At some point during this period, Chris moved to Vermont; the remaining three decided to call it quits. It certaiinly seemed like the end of Garrison, but it turned out to be just another bend in the road...read on!